The hypothesis: Troy Tulowitzki has a longer reaction time to pitches than he used to. Reaction time, in this sense, refers to the overall time it takes Tulo to decide to swing and then execute the swing. Perhaps he is only getting slower mentally, perhaps only physically, perhaps a mix of both. Regardless the source of his decline, my hypothesis is that Tulo has been slower to react since the beginning of 2015 than he has over the rest of his career. I posit that Tulo’s decline and the league’s increase in velocity have caused him to pass a “tipping point,” which has kneecapped his production. 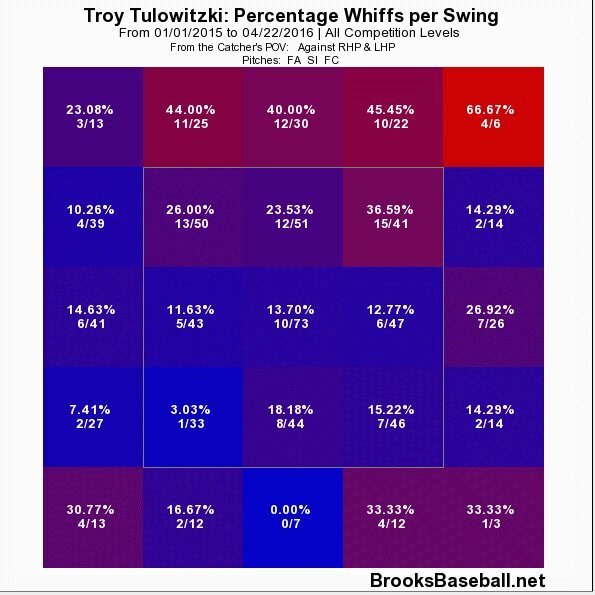 Here is a profile of Tulo’s swing rates from Brooks Baseball. The data are from 2008-2014, before his decline. Figure 1. Swings/pitch 2008 to 2014. Throughout his career, Tulo has preferred to swing at pitches middle in and up in the zone. Now consider where he did his damage. Figure 2. Slugging on contact 2008 to 2014. Again, Tulo seemed to prefer the ball up. He was most dangerous in the top two thirds of the zone and he could cover the entire width of the plate. Location is important because the reaction time required to hit a pitch changes depending on where it is located in the zone. A pitch gains velocity as it moves up in the zone, or as it moves toward the hitter, while pitches are effectively slower as they move down and away. Historically, Tulo has been most dangerous on pitches in the areas of the zone that require the shortest reaction times to hit. Now consider how productive he’s been since the beginning of 2015. Figure 3. Slugging on contact 2015 to present. Aside from the overall decline in the production in nearly all zones, it is noteworthy that Tulo’s most productive area has shifted from the top to the bottom of the zone. From 2008 to 2014, Tulo’s production was highest in the top third, second-highest in the middle, and lowest in the bottom third. That pattern has flipped, as now he’s most productive at the bottom of the zone and least productive at the top. While these data are consistent with my reaction-time hypothesis, it’s also possible that Tulo has changed his approach to favour pitches down in the zone. Here is a profile of Tulo’s swing rates in the past year. Figure 4. Swing/pitch 2015 to present. 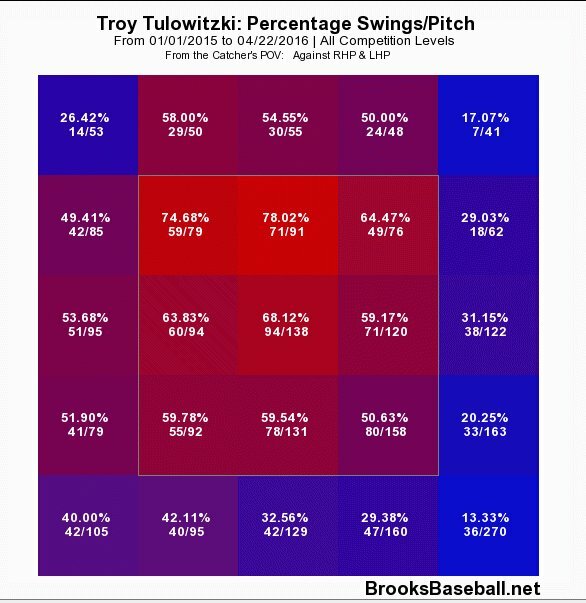 If anything, Tulo has doubled down on his up and in approach, swinging at 75% – 78% of pitches up or up and in. 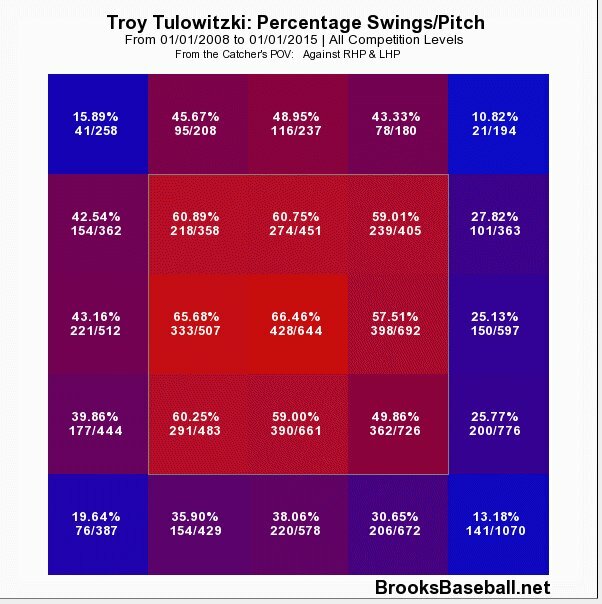 Tulo is swinging much more often at high pitches, and slightly less often at low pitches. It doesn’t appear that he switched his approach to attack the bottom of the zone. Let’s focus specifically on Tulo’s ability to make contact with the hard stuff. The two figures below show Tulo’s whiff-per-swing rates against all fastballs, the first from 2008 to 2014, the second from 2015 to present. Figure 5. Whiffs/swing, 2008 to 2014. Figure 6. Whiffs/swing 2015 to present. Tulo has basically lost the ability to handle high fastballs. Historically a high-fastball killer, now Tulo can’t seem to catch up. He swings and misses more than twice as often on fastballs in all three locations at the top of the zone. Let me spell it out: Tulo whiffs 2.57 times more often up and in, 2.77 times more middle-up, and 2.68 times more often up and away. And it gets much worse when you consider up out of the zone: He’s swung and missed 4.6 times more often at pitches on the outer third and just up out of the zone. Yikes. While consistent with my hypothesis, swinging through high fastballs isn’t the only deficiency I’d expect if a hitter has lost some reaction-time skill. Pitch recognition and plate discipline are also affected by a hitter’s reaction ability. Discipline depends on a hitter’s ability to decide quickly whether a pitch is a strike or a ball. Tulo set a career high last year with an O-Swing% of 30.6%, three full points above his previous high in a season of 27.6%. Tulo is chasing pitches outside the zone more than ever before. Pitch recognition depends on a hitter’s ability to recognize pitch type in time to adjust his swing. Here is a chart of Tulo’s average spray angle as a function of pitch type. Spray angle indicates the direction (left field to right field) that balls are hit on average. Thus, the more positive the average spray angle the greater the tendency to pull that pitch type. As you can see, Tulo has historically hit breaking balls and off speed pitches with the same spray angle, suggesting that he was able to recognize and wait back equally well for both pitch types. Figure 7. Average spray angle by pitch type, 2008 to present (short seasons in ’12, 14, and ’16). 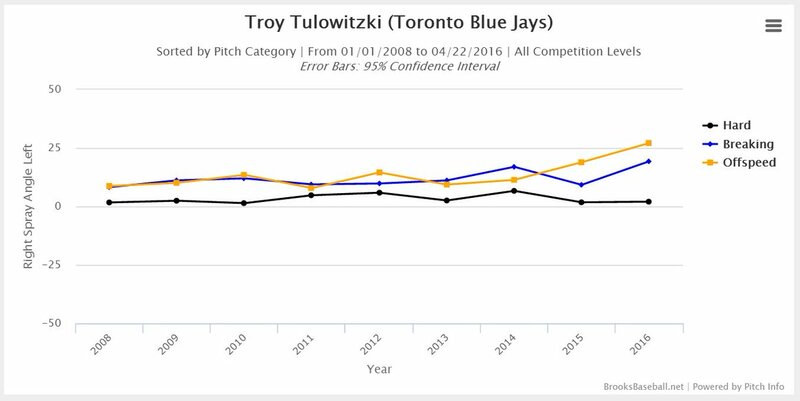 In 2015 and onward, Tulo has been pulling offspeed pitches much more than breaking balls. The result (which I won’t bother to show you graphically), has been an abundance of roll-over ground balls against offspeed pitches. Breaking balls are easier to recognize out of a pitcher’s hand than offspeed pitches. So while Tulo is still able to use the earliest information to make an adjustment, he seems unable to make use of later trajectory and spin information that would allow him to recognize and adjust to offspeed pitches. Maybe this is because his response speed to the later information has slowed, or maybe it’s because Tulo is committing to his swing too early to make the adjustment. I would guess the latter. So in summary, the reaction-time hypothesis is supported by evidence suggesting Tulo is most vulnerable when the required reaction time is shortest, he is less able to recognize pitch location in time to lay off, and he is no longer able to adjust to offspeed pitches as well as breaking balls. I’m a Jays fan and a Tulo fan so I won’t be ending this post with a “Tulo’s washed up” conclusion. I watch this guy almost every day. He’s still got the athleticism, the power, the hand-eye, and the swing. That said, the data have me convinced that he needs to make an adjustment. The first thing I’d try is almost embarrassing to suggest, but I’ll suggest it anyway. Tulo should swing a lighter bat. Hear me out. Tulo just turned over the wrong side of the aging curve – especially for a shortstop – and meanwhile the league is throwing faster than ever. He used to have success with an approach that requires superhuman abilities, and now that he is slightly less superhuman, that approach isn’t working. Perhaps changing the swing weight of his bat, shaving off an ounce, could allow him to catch up to the pitches he’s not getting to and return him to some semblance of his previous form. Take a look at the two schematics below (conceptual, not to scale). The full line from Release to Contact represents the timeline of the pitch. The lines for “Breaking ball,” “Offspeed,” and “Location,” represent the moments when the hitter finally has enough information to process these respective features of the pitch. Hitters recognize pitch type before location and breaking balls before changeups. The coloured bars represent the time required to execute the cognitive and physical aspects of the swing. The decision to swing must be completed by the beginning of the blue bar (response selection), in order for the brain to have enough time to make the necessary commands (response selection) and execute the swing (movement time). My hypothesis suggests that the length of one or both of the coloured bars has increased for Tulo, while the length of the entire timeline has shortened for him (and everyone else). I propose that both factors have pushed the blue bar to the wrong side of the deadlines for offspeed and location, causing Tulo to swing at more balls and fail to recognize changeups in time to adjust. The longer reaction time leaves Tulo vulnerable against hard stuff up and in, yet that’s exactly where Tulo made his money throughout the rest of his career. The “Tulo Now” schematic represents things since 2015, while the “Tulo Lighter Bat” figure depicts my proposed solution. I’m not sure if anything can be done about a longer response selection time, but my hope is that a lighter bat could reduce Tulo’s movement time enough to get him back to the right side of those offspeed and location deadlines. If Tulo can’t shorten his overall response time, he’s not going to be able to approach the game the same way he has for the rest of his career. He’ll need to start looking down, looking away, and spitting on high fastballs. Basically, he’d need to give up on what made him great. I know trying a new bat might be a hard sell for a guy who won’t give up his 100-year-old beaver tail of a mitt, but I think changing bats might be easier than changing everything else. Including a swing that still looks fantastic. We hoped you liked reading The Tulowitzki Hypothesis by Brad McKay! Player, coach, researcher. I love the game for its own sake. This is great work. The whiffs/swing charts nail it. Don’t have a heat map for you, but I checked and he whiffed on 95MPH+ pitches 24% of the time in 2015, which was 26% more often than he had previously. Tulo swings a 34/31.5. Not sure how much lighter he can get without either shaving down the diameter of his bat or going shorter. Really, eh? I tried (very briefly) to find his bat specs before posting this. You’re right, not a lot of wiggle room. I know Marucci offered the Joey Bats model last year as a 34/30, so he could go lighter and keep his length. The barrel would need to get thinner, though. Then I say heck yeah, get that 34/30 in his hands! LOL Yes, if Tulo were swinging a Soriano-like club I’d be much more confident that he’d have something to gain from lightening the load. Nevertheless, you can see the possibility there. Interesting theory. Do you have a home/road breakdown at all? I’m wondering if getting out of Coors has any kind of effect from both the climate change difference and the hitting background difference. I don’t have the home/away splits, so I tried splitting at the time of the trade. 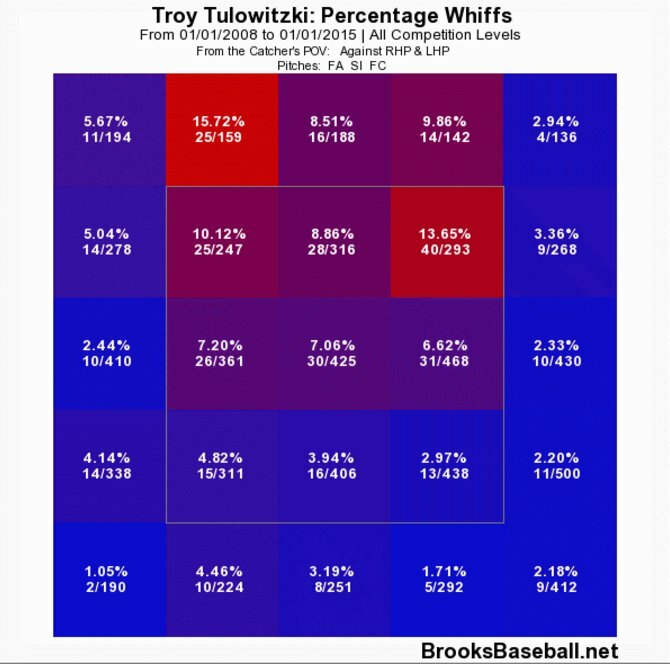 Since Tulo has come to Toronto he has whiffed on 31% of fastballs in the top third of the zone (24/78). While with Colorado in the first half, he whiffed on 25% of high heaters (21/83). In 2014 and 2013 it was 21-22%. The trend might have started in Colorado, but it’s become more apparent in Toronto. I’ve suspected something like this, and wondered if the change was due to his hip surgery. The clue for me was his plate discipline numbers: they’d been very good and actually getting better prior to the surgery, but after he’s been walking less and striking out more. I thought maybe he was compensating for less lower body strength by starting his swing earlier (more movement time), which meant less time to respond to the pitch and decide to swing or hold up. Anyway, good work, and I hope he figures it out.